This mobile USB audio device can decode just about any hi-res audio file you send it, including quad-rate DSD. When we listen to music, there’s more often than not a digital-to-analog converter (DAC) in the signal path between the source, the amplifier, and the loudspeakers or headphones that ultimately deliver the sound to our ears. Those two components can make or break your audio experience. 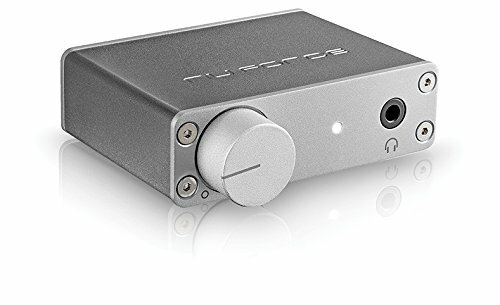 When your source playback device is a computer, the quality of the DAC you’re using becomes even more important. Computers are great at lots of things, but audio reproduction isn’t their forte and computer manufacturers don’t invest significant sums into the computer’s DAC or headphone amplifier; most don’t even pay much attention to isolating the computer’s audio components from the electrically noisy environment inside the computer’s case. Installing a high-end sound card in a desktop machine is one option, but you can’t do that with a laptop. 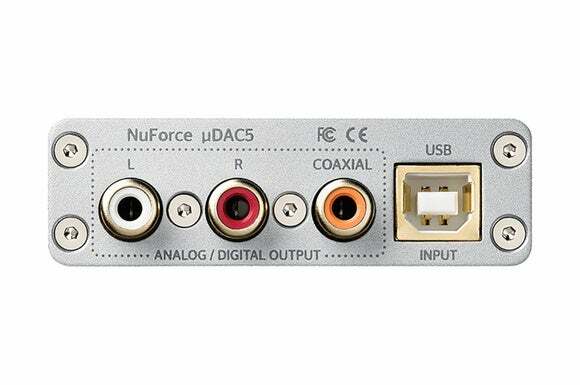 That’s where Optoma’s NuForce uDAC5 comes in. Personal computers—both Windows and Mac machines—convert digital audio to analog and output to 1/8-inch jack, but they also send the digital bit stream their USB ports, keeping the music in the digital domain where it's virtually immune to interference. When you plug the uDAC5 into one of its USB ports, the uDAC5 will convert the signal from digital to analog and send the analog signal to both its stereo outputs (for connection to powered speakers or an outboard amplifier) and to its onboard headphone amplifier (for use with headphones). The uDAC5 also passes that bit stream to a coaxial S/PDIF port, so you can use a different DAC if you prefer. For all it does, the uDAC5 is tiny enough to fit in the palm of your hand. It’s extremely light at 3.53 ounces, and it’s ultra-portable, measuring just 2.68 inches wide by 1.77 inches deep by 0.83 inches high. I was able to carry it in the same case as a set of Oppo PM-2 headphones. You can just as easily slip it into a jacket pocket or purse. The heart of the uDAC5—an ESS Sabre Hyperstream DAC—is housed inside a gray metal enclosure, and it natively supports just about every hi-res music file format you can think of, including FLAC, ALAC, and WAV, as well as DSD files up to a maximum of 384kHz/DSD256. It can handle PCM sampling rates of 192-, 352.8-, 384KHz, and DSD sampling rates of 2.8-, 5.6-, and 11.2MHz. The plain front panel has an analog volume control and a 3.5mm headphone jack, but there is no IR remote control receiver. Optoma says that in contrast to its predecessor, the uDAC5 will deliver 140mW at 32 Ohms, so you can drive just about any in-ear headphones and most over-the-ear headphones. None of the over-the-ear headphones I had in-house and tested with the uDAC5 are tremendously difficult to drive, and the uDAC5 drove them all with ease and control. Mac users can just plug in the uDAC5 and go; Windows users will need a driver that Optoma provides as a free download. Mac users will need to select the uDAC5 as their source and change the sampling rate in the Audio MIDI app located in the Utilities folder. I used BitPerfect for iTunes and JRiver Media Center on a MacBook Air, which do this automatically for me. 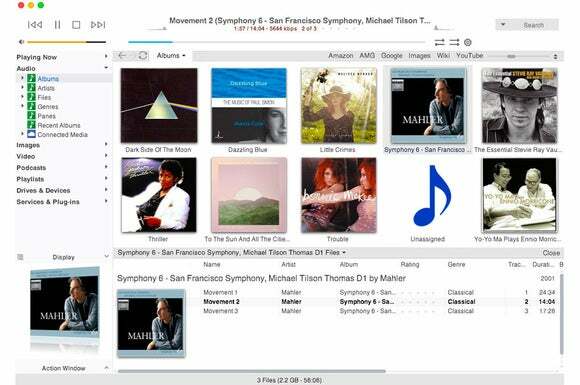 If you plan to play hi-res music files with the uDAC5, be sure your software-based media player supports the formats you want to play. iTunes, for example, doesn’t support FLAC or DSD. You can convert FLAC to ALAC (Apple’s lossless format), but if you want to play DSD files, you might want to consider using the cross-platform JRiver Media Center. There are a number of other software options to choose from as well. I tested the NuForce uDAC5 using JRiver Media Center 22 and iTunes with BitPerfect, though the specific examples noted in this review just happen to have been via JRiver. 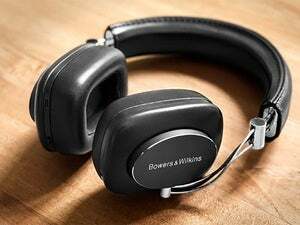 I also tested the NuForce with four different headphones: the open-back Oppo PM-2 and the closed-back Bowers & Wilkins P7 Wireless, Meze 99 Classics, and V-Moda Crossfade Wireless. I compared the uDAC5 to the stock 3.5mm headphone output of a MacBook Air. If you plan to use lossless FLAC and DSD files with the uDAC5, you might want to use a media player like JRiver, which is capable of playing just about any lossless file format. The difference the NuForce uDAC5 makes on your music is dramatic and immediately noticeable. The uDAC5 tightens up the bass, cleans up the mid-range, and opens up the top end. It’s like getting an audio tuneup. With exceptionally well-recorded source material, the difference becomes even more evident. For example, through the uDAC5, City of the Sun’s “To the Sun and all the Cities in Between” (192kHz/24-bit, Chesky Records) exploded with incredible detail. Each guitar stroke on “Brothers,” the eponymous title track, or “Dance of the Dead” was delicately rendered with exacting precision. Comparing the those tracks to the Macbook Air’s built-in headphone jack was night and day. Through the Macbook, the midrange was thicker and voiced significantly warmer. Musical details that popped through the uDAC5 seemed smoothed over through the Air’s built-in jack. Mellowing out to Melissa Menago’s “Airplane” on Little Crimes (192kHz/24-bit, Chesky Records) or the “Main Theme” from Malena from Yo-Yo Ma Plays Ennio Morricone (44.1kHz/16-bit) showed how the uDAC5 could beautifully convey the sense of space in a recording. 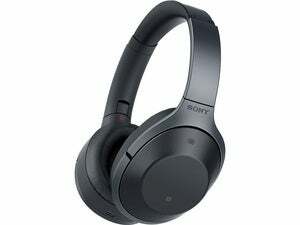 On closed-back headphones like the B&W P7 Wireless, you could appreciate that sensation even more. Outputs include stereo analog and S/PDIF digital. I really liked what the uDAC5 did for bass response. The recurring drum beats on City of the Sun’s “Imagination” were thud-like when played through MacBook Air’s headphone jack. It was similar to listening to someone hit the side of a hollow wine barrel. Running that same track through the uDAC5, I could now hear—and sense—the texture of the drum’s membrane and follow it’s reverberating decay. 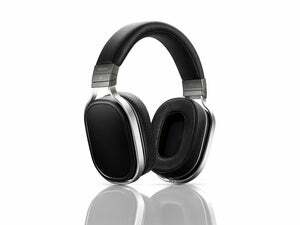 On headphones that emphasize bass response, like the V-Moda Crossfade Wireless, I found that the added detail helped a bit of the congestion the headphones exhibit in the upper bass and lower mid-range. Playing DSD files with the uDAC5 and JRiver was flawless. They sounded superb. Whether it was Pink Floyd’s immortal classic, Dark Side of the Moon or Mahler’s Symphony No. 6, the uDAC5 presented each track and movement with precise instrument detail and a stable sound stage. The DSD version of Michael Jackson’s Thriller put the album’s musical genius on full display. The different layers of each song’s music mix were clearly discernible. Van Halen fans will love the way Eddie Van Halen’s guitar work comes through on “Beat It.” What caught me most was hearing Michael Jackson’s oh-so-subtle, yet distinct, finger snaps on “Billy Jean.” They were so delicate and tonally correct through the uDAC5. Through the Macbook Air, the finger snapping didn’t sound like real finger snaps. Details make all the difference. My only constructive criticism of the uDAC5 is that at times its presentation can come across as too precise and analytical. You might even say that the top end is bit too crisp. You certainly won’t mistake the uDAC5’s presentation for the output of a turntable. If you're looking to make a relatively modest investment that pays big audio dividends, Optoma's NuForce uDAC5 is a sure bet. 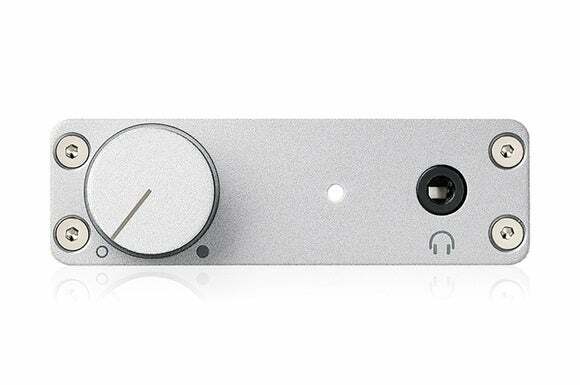 This USB-powered, portable DAC will improve just about anything you feed it. It shines particularly bright with stellar recordings in hi-res. 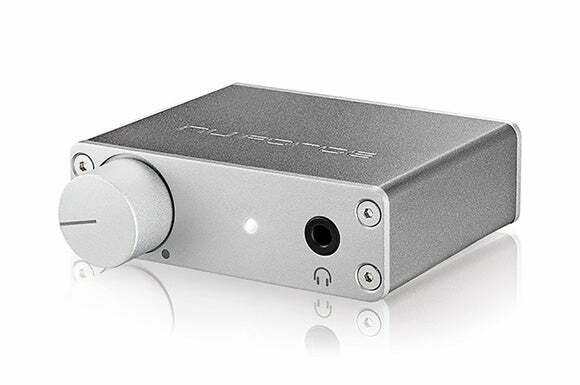 Factor in DSD support, the ability to work with powered speakers, and analog or digital connectivity to a high-end audio system and you have a real winner. This tiny DAC delivers hi-res audio at home and on the go.